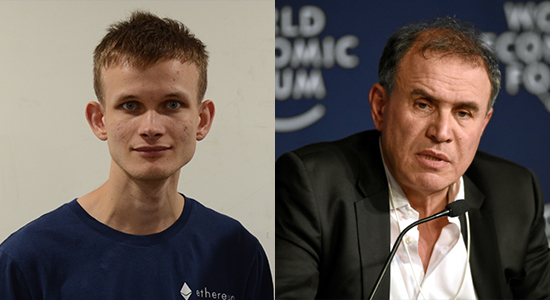 New York University economics professor Nouriel Roubini, known as Dr. Doom, an outspoken critic of crypto, and Vitalik Buterin, the Ethereum founder, clashed over the value of cryptocurrency during a session at the 2nd Deconomy held in Seoul on Thursday. Prof. Roubini began his debate by blasting crypto investors, warning that a bubble is about to pop. Cryptocurrency, he claimed, is not a financial system but more or less a barter system. It is inefficient, unsafe, not a store of value, and volatile in value. Furthermore, it is a costly and fraudulent system, he argued. Responding to the scathing criticism, Vitalik Buterin, who is among the most influential people in the crypto world, defended his optimism predicting improvement in efficiency of the cryptosystem over time when many people have access to the decentralized system. Their bickering has reached a crescendo when they touched on crypto anonymity. The professor claimed only criminals or tax evaders prefer anonymity and that virtual coin should not serve as a `Swiss bank` for the next generation. Buterin retorted that the government influences the bank payment system and intervenes in business management. The issue of anonymity should also be considered in terms of resistance to censorship. It is increasingly difficult to resist authorities in the offline world and privacy is disappearing. This is where social autonomy is undermined, he added. The heated discussion led to the fundamental trilemma of cryptocurrency: scalability, decentralization, and safety. The professor argued that cryptocurrency transaction is not scalable and centralization inevitably is needed to ensure a certain degree of scalability. It is out of the question to suffice the three at the same time, he added. Buterin did not agree and predicted advance in science can enable decentralization, scalability, and security.